Are you having a corporate event, a presentation, a birthday party or a wedding and you want to play your own music instead of hiring a DJ? Or maybe you would like to have one of your friends as your DJ, but he doesn't have a sound system? Or maybe all you need is a microphone with a speaker for your next presentation or a seminar? We are the most reliable and affordable event sound system and DJ equipment delivery rental service in Southern California. The equipment will be delivered and set up at your event location by our professional sound technician. The PA system will be connected directly to your laptop or ipod so you can play your own music and use the microphone whenever it's needed. In addition to sound equipment rentals, we can also provide affordable event lighting, affordable DJs, affordable photography and affordable videography. For availability information and booking details, please fill out this form. - One active powered speaker with a heavy-duty tripod stand. - One wired microphone that connects directly to the speaker. - One boom stand for the microphone. - One audio cord for your laptop or ipod. Connects directly to the speaker. - Delivery, setup, teardown, power extensions, labor and tax are included. 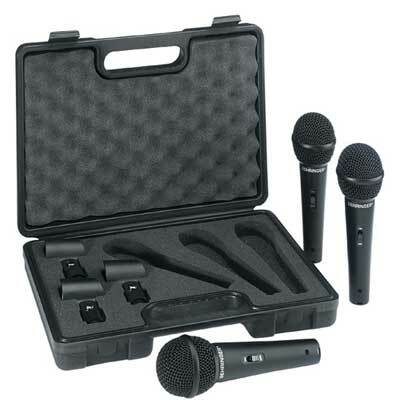 - Since no sound board is included in this package, the music and the microphone cannot be used at the same time. - $0.25/mile travel fee (round trip) will be added to all bookings. ﻿- 2nd speaker with the 2nd heavy-duty tripod stand. - Small sound mixer Behringer Xenux 802 or similar. Comes with two XLR mic inputs and two ¼ inch stereo inputs, which allows you to play music and use the microphone at the same time. -2nd sound system for the 2nd location. Perfect choice for any event when two sound systems are needed in two different rooms. For example: 1st one for the outdoor ceremony and the 2nd one for the indoor reception. - Active speaker on a stand within 50 feet of another speaker - $150. - 12'' Subwoofer (adds more punch and lower frequencies) - $150. 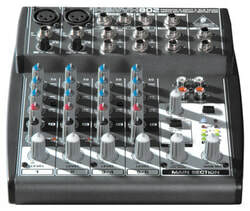 - Small audio mixer with 2 XLR mic inputs and 2 ¼ inch stereo inputs $50. 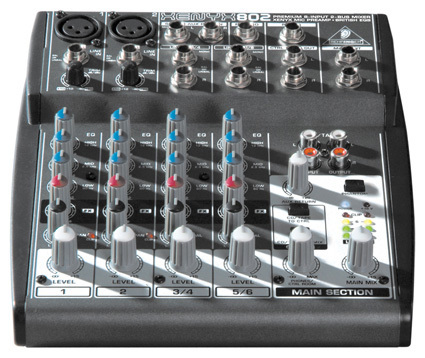 - Large audio mixer with 8 XLR mic inputs and 4 ¼ inch stereo inputs - $150. - Wired microphone with a 25-foot XLR cable and a boom stand - $25. What areas/cities do you service? Our PA sound system delivery rental services are available in San Diego, Orange County, Los Angeles, San Bernardino and Riverside. A small travel fee of $0.25/mile is added to all bookings. Do you provide liability insurance? Yes! However, our liability insurance is valid only when the equipment is in our care (during setup and teardown). As soon as our technician leaves the event site, the client becomes responsible for any damages or incidents. If you would like to have liability coverage for the entire event, we can provide an experienced sound and lighting technician that will stay on site, keep an eye on the equipment and help you run it for $50 per hour. Although this service is optional, we highly recommend it. What equipment brands do you use? We mostly work with a famous German brand called Behringer due to the affordability of their high-quality professional products. How powerful are your speakers? 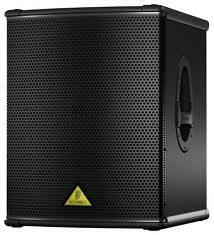 The most popular speakers we use are Behringer B215D. 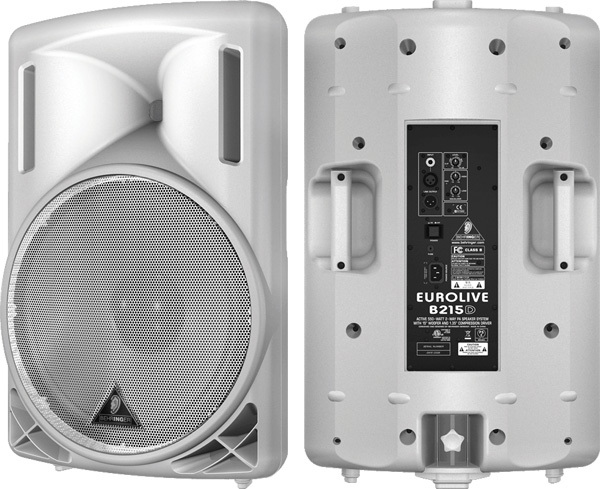 They are large 15 inch, 550 watt speakers that provide very loud and rich, high-quality sound that is good for any event size. Depending on the number of guests and your event venue setting, you may need to add some extra speakers to your package. However, usually two speakers are sufficient. How will I know how to use your equipment? First of all, our sound systems are very easy to use. Everything will be set up and properly adjusted for you, so the only control you would need to worry about is the volume. Our technician will show you how to increase/decrease volume and also provide a short manual/troubleshooting guide for the duration of your event. Is your equipment waterproof? No, the gear absolutely cannot be exposed to rain. Can you move the speakers from the ceremony area into the reception hall? Unfortunately, it take time to safely move all the speakers, stands, microphones, sound mixer, cables, extensions and make sure it's all setup properly and not in anyone's way. Because of this we usually set up a separate sound system for each room/area. This way all the equipment is ready before your guests start arriving and nothing needs to be moved. Do you offer any military discounts or other specials? Our sound system rental prices are so low that there is no room for discounts. If you shop around, you will probably see that our rates are among the lowest in Southern California. Our strategy is to be fair to every client and charge everyone the same price. We look forward to working with you!